Babies can now enjoy and learn the alphabet with BabyTV's new groovy alphabet song. 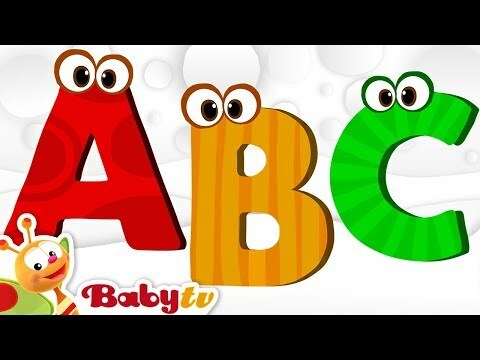 Learning ABC has never been more fun as it is with BabyTV's new ABC song! So come along and sing your ABCs with us! Each letter is a character and comes to life. Join the letters as they pose for an alphabet picture, and play peekaboo and catch with the photographer. Singing the alphabet song can help children learn the letters in an easy and fun way. The catchy song tune, the fun and playful animation and characters make learning enjoyable for toddlers, babies and kids. A, b, c, d, e, f, g, h, i, j, k, l, m, n, o, p, q, r, s, t, u, v, w, x, y and z. Now I know my ABCs, next time won't you sing with me. BabyTV is the world's leading baby and toddler network from FOX, airing 24 hours a day and completely commercial-free. BabyTV features top quality shows that are created by child development experts and are designed for child & parent to enjoy together. Each hour on BabyTV is an enriching journey full of stories, songs, rhymes & loveable characters. BabyTV's library features many original series that have been created by our dedicated team and which address the entire spectrum of early learning skills and development milestones that babies and toddlers encounter in their first years.